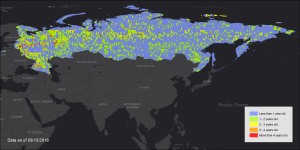 The available DigitalGlobe EarthWatch imagery over Russia by location and with the most recent coverage date indicated with varying colors. In the vast majority of locations, there are multiple imagery dates available. This entry was posted in The Geospatial Times and tagged DigitalGlobe, DigitalGlobe Basemap, DigitalGlobe EarthWatch, Imagery, product updates, The Geospatial Times by Apollo Mapping. Bookmark the permalink.